Here's a glimpse from our world. Snow overnight on top of the ice. It is so beautiful and crunchy. It wouldn't be a good idea to be out on the local roads, yet we are not as affected as the northeast is today. Steve gave me a Churchmouse Yarns gift certificate for Christmas, which I had great pleasure in spending. My wonderful package arrived last week, and that is a gift unto itself. 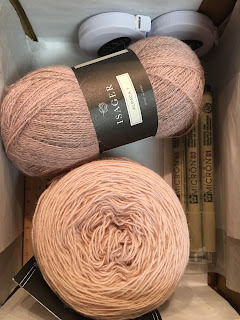 That's two beautiful skeins of Isager yarn, Alpaca 1 in #61 plaster and Spinni in #61 shell pink. I plan to double-strand these for a lovely cowl, but for now I'm going to enjoy just admiring the yarn on the skeins. Thanks to Sharon for her recommendation on this combo, I would not have come up with it on my own! I started this Purl Ridge Cowl in Berroco Ultra Alpaca (periwinkle) last February and stuffed it away in a bag after a few rounds. After picking it back up a couple of weeks ago, I plowed through it and even got inspired to make a pair of matching fingerless gloves. I was inspired by this lovely set by Gretta in Australia. We were supposed to enjoy dinner out tonight with friends Susan and David at a restaurant in Denver. (Not that Denver, but Denver, NC -- did you know there is also a Dallas, NC?) I was going to give this set to Susan tonight as a surprise gift. She ordered a purple bullet journal for herself, she has the purple Inkjoy Stylus pen, and she always has a pretty manicure with beautiful rings, so I thought this set would be perfect for her. The bad roads have made us scrap our plans so Susan (! ), if you happen to read this before I see you, SURPRISE! Next I cast on a third Churchmouse Welted Cowl in Rowan Felted Tweed in color 165 Scree, described as barely blue stone grey. I should have enough yarn to make a matching pair of CM welted fingerless gloves. Steve mentioned this morning that he would like a pair of handknit manly fingerless gloves, which would help him with his photography in the cold weather. Yaaaayy, I'm thrilled about this. If you have a favorite men's fingerless gloves pattern (very plain) and suggested yarn, please add to comments! About this time tomorrow, we'll be settling in to cheer for our Panthers as they beat Arizona to proceed to the Super Bowl!!!!! Love the color of your new yarn. Happy knitting. Do I spy some Pigma pens in the box? I love using them for quilt labels. beautiful snow photos, yay! I've knit purl ridge and enjoyed that pattern so very much. what a lovely gift! I just found your blog via Ravelry. Your husband wants fingerless gloves? Knit Churchmouse's Ferryboat Mitts. I knit my husband a pair in grey and they are so nice and warm, plus they are a fast knit! Hi Sara, thanks so much for writing. Please 'friend' me on Ravelry. I appreciate your suggestion; I actually purchased the pattern for Ferryboat Mitts recently, and it didn't even occur to me that it would work for a guy. I think it will be perfect! Thank you! I purchased the micron pens to go with my bullet journal. They are wonderful, I would highly recommend!